The aim has been to build and use an inexpensive spectrograph. A very useful website is http://astrosurf.org/buil/ and click ” Spectrographs” and then “Compute a Classical Spectrograph” which includes plans and advice for building the spectrograph, useful information about the Canon EOS 350D (Rebel) and its subsequent upgrades, and technical data about the spectra that can be obtained. The crudest part of the MRS135 is the diffraction grating holder and I would suggest that it may be worth purchasing one if at all possible. However, they are not cheap (they may be more accessible in the USA but in Australia exchange rate and handling costs are causing difficulties) . Many commercial products use a micrometer-driven grating holder to get a more-precise angular position of the grating. In fact, I have recently added micrometer control of the grating angle to the MRS135. This enables one to “dial-up” the approximate central wavelength of the spectrum. This does not give exact wavelengths and determining these must be done by software which I discuss elsewhere. The MRS135 is inserted into the telescope focusing tube by having the 1.25″ sleeve of an eyepiece firmly glued to the entrance plate. It requires a fairly solid telescope to handle it and it is important to make sure that the image of the star can be positioned at the focus of the collimating lens. Another apparently crude aspect is that I have used my general-purpose Canon EOS350D as the detector. An old 50mm f/2 lens from a film camera is used as the camera lens attached to the EOS350D. However, I believe that this setup has worked quite well, especially as these cameras are now quite cheap and can therefore be modified without one being too scared. I will give more details of the design of the MRS135 later and will also comment on the very useful (and nice) mathematics used in the website. However, here I will just make some general comments about stellar spectroscopy with the MRS135 and give some philosophical remarks about tackling such an enterprise. As background, I state that I am a theoretician who is not very good at making things. I certainly cannot use machine tools and in the main I build (at least initially) in wood. It took me quite a while and several prototypes to get the results that I have now. When I read of other people building these things, they imply that they knock it off in a day and get useful spectra one or two nights later. Maybe they do, but I suspect that they had a small but knowledgeable team who had at least some ideas before they started. Nevertheless, the results have been very satisfying and the building very educational. With these things, I believe you think it sounds easy until you try to do it yourself and at the end you do understand it, rather than just think you do. There are some things that I have done which have worked for me but are unconventional and almost certainly not preferable for everyone. Writing my own software instead of using the excellent software already written, eg IRIS, MaximDL, IRAF. This is probably because I am not good at following instructions. Using .jpeg images and Photoshop. Just one example of spectra obtained is given here to show the potential. Gamma Velorum is a very hot Wolf Rayet star in the southern constellation of Vela. As well as the usual absorption spectral lines on the continuous background of the star, it has strong, wide, emission lines. Click the thumbnail to see an expanded view of the spectrum of this star obtained by the MRS135. I suggest you save the full-size file and then save and view it in Photoshop. That way, I can discuss the lines at various values of X in Photoshop. This image will be discussed later. Here is a link to a full discussion of the MRS135 if you want more. 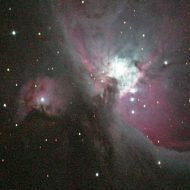 An image of the spectrum of M42, the Orion nebula, has been taken with the MRS135 with a slit. The average dispersion is 1.037Angstroms/pixel. This image was created from a 93 sec exposure at ISO 1600 in order +1. Of course, it has been processed by software. I have purchased a (second) second-hand EOS 350D from ebay and removed the infra-red blocking filter (with some help). This modified camera has greatly extended the range of spectroscopic possibilities. Instead of spectra spanning only about 4200 Angstroms (420Nm) to 6800A (680Nm), they now cover from 3900A to about 10000A. However, overlapping of spectral orders can cause some complications and these are discussed below. Refer to the website http://astrosurf.org/buil/ and then go to Spectrographs and then to Near Infrared Spectroscopy Methods (English version). While on this same website, go to Cameras and Canon EOS350D IR filter removal and spectral characterisation which shows the expected response of the CMOS detector after the filter has been removed. This is discussed further below. For wavelengths greater than about 6500A (including the important 6563A of Hydrogen Alpha), the response is greatly improved. However, above 7800A the response is complicated by the overlapping of the first and second orders. For the Infra Red of the first order, the spectrum can be isolated by using only the red channel in Photoshop. However, as can be seen by the response curves given in About the Canon 350D IR filter , this wastes the majority of the signal, which comes through in the Blue channel. The solution should be to insert a red filter in the MRS135 to preclude the second order blues from interfering with the IR and then to use the response from all 3 (R, G, and B) channels. I have not yet done this. Similarly, for analysing the second order of wavelengths 3900A to about 4700A by using the blue channel in Photoshop, the blue response in the IR is added to the required signal. It should be possible to overcome this by including a blue filter in the MRS135.